A series of personal experiences and sequences of walked space defined by the tectónica, mater and space. The memory, the interest about the past, the ruin and the monumental character defines an image that is a contrast between the traditional and the contemporary time. An image that has to be with the condition and the evolution. An image with a clear purpose recalling the past and the memories reinforcing the idea of designing from the personal experience and memories. A walk that focused in Bank of England designed by Sir Jon Soane that specially interested myself. A piece that was drawn and analysed. A collage piece that it is understood as a sequence of spaces in plan and section happening the same way in the plans of the project referring to the collage, the different options, drawing one of the multiple solutions of the system. The tecnique and the construction plays an important role detailing the brick wall system as well as the armed vaults being faithful to the brick as the predominant material. It has an important spatial richness in the interior being rigorous to the system. Understanding the campus as a sequence of spaces between walls having the same facade module of 4.5 meters. The east-west axe mantains the original visual and generates new different diagonal visuals. On the other hand the north-south axe does not need any structure because the armed brick vaults provocate a direct visual through the overlapping of glass vertical planes. Doubles and triples heights colonise the old medieval Smithfield square becoming new classrooms, yards and work rooms. A sequence of spaces that separes from London by the limit of the brick and stone facade. 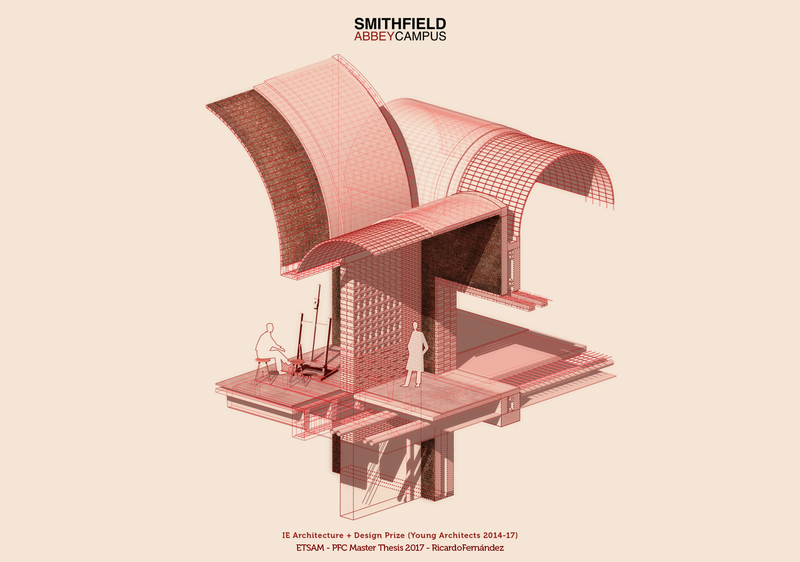 In conclusión Smithfield Abbey Campus is a reminiscence to the past architecture having a view to the future with the tecnique and the construction. It is a travel to the origin and an exploration to the future.